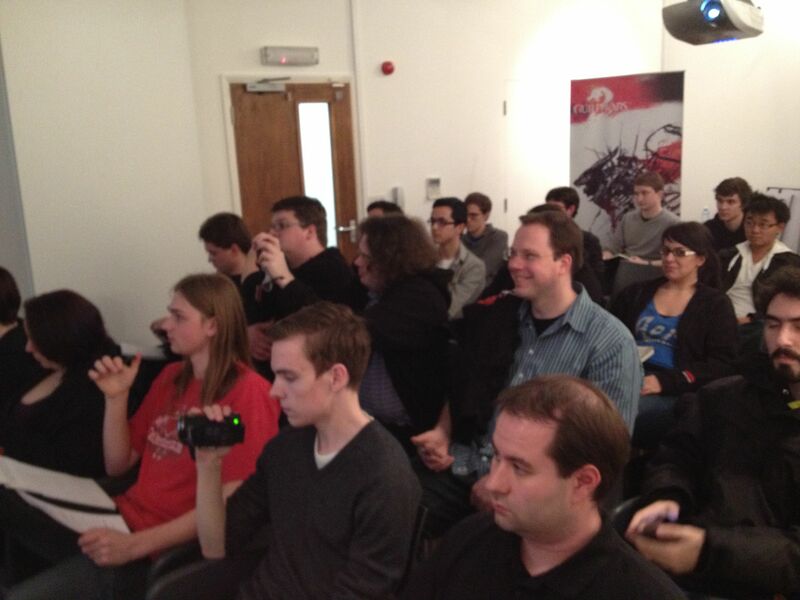 So I was invited to attend the EU Fan Day in Brighton earlier this week and as part of the activities, we had a teleconference Q and A session with a few of the ArenaNet team. We got an hour to ask questions which turned out to be about 1 from every fansite in attendance. There’s quite a variety of questions and some juicy answers too! Because it takes quite a while to transcribe something of this length, part of the Q and A is here and the other part can be found over at GuildMag. Attendees from ArenaNet were Eric Flannum (Lead Game Designer), Colin Johanson (Lead Content Designer), Ree Soesbee (Writer and Lore & Continuity Designer), Kristen Perry (Character Artist) and Josh Petrie (Tools Developer). Regina Buenaobra was also there live tweeting. As I don’t know everyone’s tags and it feels wrong to post real names on the internet, I’ve sourced questions according to the fansite. If I get permission later to release the audio I recorded, I will do so. Note that I have tried to be as accurate as possible without including all the “erms” and “ums”, but there may be some inaccuracies. Also the audio was unclear at some points – I’ve indicated where that has occurred. Nerdy Bookahs: How does the overflow shard work? We know we can play PvE, but can we play structured PvP while we’re on the overflow shard and can we join structured PvP matches with friends who are on other servers? Eric Flannum: So I guess I can take that. Yes you can join structured PvP when you are on the overflow server. People who are on other servers, the matchmaking in structured PvP are between different servers so you will be able to play with people from different servers. Attached to Keyboard: What is the biggest challenge that you’ve had to face to get the game to its current stage, either programming or just trying to decide what it is that you want to make out of Guild Wars 2? Josh Petrie: From a programming perspective at this point in the game the biggest challenge we have is optimising everything, making sure it’s all going to run as fast as we can get it on all the hardware we’re going to run it on. Kristen Perry: From an art point of view its sort of the same thing we’ve been doing all along just making sure everything is as polished and as awesome as we can get it in the time we have going on. Eric Flannum: I guess design wise balance is kind of the optimisation for us. You know working on creature balance, skill balance, making sure that all the various numbers that we have in the game work actually together and everything is exactly right. That’s always tricky and takes a while, but I think is often the difference between an ok game and a great game. Ree Soesbee: From a story perspective we now have thousands and thousands and thousands of lines of text in the game written by lots of different people in the company from events to story, dungeons to everything else, and making sure that they’ve all said the same lore can be very difficult because someone will make a small point about a hylek in one map that absolutely has to be carried over everywhere else or it doesn’t make any sense and we have to find that tiny little assumption that somebody made and make sure it’s even throughout the game. GW2NL: What mechanics do you consider unfinished and will be developed further in the future? EF: I think just about every feature is eligible to be worked on depending on feedback that we get. So even if there’s something we think is perfect, it’s completely done, if when the game releases we then realise “oh ok well that thing’s not as great as we thought it was” we’ll absolutely work on it. We have a fairly sizable live team that we’re going to dedicate to creating all kinds of stuff after the game ships. One of those teams is kinda just an R & D team to come up with cool new things and to fix things that aren’t as good as they could be. You can expect to see a lot of additions and refinements and all kind of things after the game ships. GuildMag: Can you tell us anything about the upcoming PvP maps and specifically the underwater PvP map? EF: Upcoming PvP maps, I think we released a screenshot that showed a little bit of one the other day with the guardians and the warrior, both with hammers. So we’ve for 2 more PvP maps that we haven’t revealed yet, they’re both capture point, one of them… I don’t want to totally give them away ‘cos I think we’re planning on revealing them. One of them is actually going to be pretty nostalgic for GW1 players so you can expect that to be something that has a lot of familiar elements for GW1 players and the second one actually is a pretty cool one that has a lot of underwater combat and involves a pirate ship so those are both pretty cool and we’ll be talking more about those I think pretty soon. CJ: Guild Wars 1 players are going to be pretty excited I think. GWOnline/OnlineWelten: Most achievements in an MMOG at least in people’s interests, translate directly into time spent in game. At the same time these achievements have some kind of social value to them. People like to compare their characters, dungeon runs etc. How will micro transactions affect the social dimensions of MMORPG and game play? EF: Some of the items in the shop that you guys have seen are basically things that can kind of circumvent a bit of time spent in the game and our achievements, if you go back and look at them, are a combination of things that take time as well, but there are also lots of things, I think even the majority of things, that don’t really take time and can’t really be effected by cash shop things. So achievements like killing other player in WvW or for PvP, or achievements for things like finishing dungeons or doing things like that, most of those things really can’t be circumvented or rushed along by using micro transaction and then we’ve got kind of just the way that our achievement score works, it’s kind of just an aggregate score and so there’s no real top limit to it. So when you’re comparing with your friends, you kind of just have this one achievement score that you’re comparing. I don’t think micro transaction, it will have some affect on it, but it won’t be the major determining factor in whether someone has a super high achievement score or not. CJ: Some of those things too that you show off in game as achievements of stuff that earned, So like if you do explorable dungeons and collect the rare armor sets or rare weapons that come from that dungeon, those are things where you can’t take those items and trade them around with everyone. They’re bound to your character for completing that stuff, so it’s a sense of this is your ability to show off to everybody else “I did this” and people can’t get those abilities from the cash shop. Those are purely things that people playing the game, who are skilled enough to beat the dungeons can earn them and that’s the only way to get them. We think that’s really important too is things like that are achievements that allow you to show off to everybody. Those will stay limited to people who can earn them and the amount you spend will have no effect on those. DragonSeason: What is your number one thing you are worried might just go wrong? KP: There’s always something to go worry about, it’s just preparing and making sure everything doesn’t go wrong. RS: Yeah if we thought of something that we’re scared will go wrong, we’ve been trying to address it. EF: The big thing is something always goes wrong, I think we learnt that from our previous game releases, so the big thing is to be ready for when that happens and be able to respond to it. But I mean, if there were anything that er, I mean the sort of the “I’m pretty sure this isn’t gonna happen” but you always worry about some progression stopping bug getting through right, like I think we had that with Nightfall where something snuck through, but with a game as big as Guild Wars 2 is, I think you always worry about the you know how can we have possible seen everything that could possibly happen with it. We worry about that. But the big thing is we’re always ready to respond to that. We know that the day we release is not the end day; it’s kind of the beginning. We always have the mindset of we’re ready to respond immediately. KP: Yeah especially if there’s ever a wardrobe malfunction I need to be on that. CJ: My biggest fear is that the day the game comes out people will forget to eat and sleep. That is very important. Please remember to sleep and eat. We don’t want to lose any of our community! KP: Well look at it that way too, that the hallucinations from sleep deprivation will be some added special effects! Wartower: I’m a big fan of raiding and I was very happy to hear an attrition mechanic so ultimately players are going to go game over and turn around. But what I didn’t like was the addition of a micro transaction that could circumvent this attrition. Do you have any plans for the raiding community to lock that item out of final group raiding? CJ: That item is actually not usable in dungeons. It is not usable in the high level raiding type stuff. Gaming-insight.de: I’m really interested in craftable items compared to normal loot you get from dungeons concerning the end game and raid content. How important will it be to rely on craftables and how much do I need my dungeon loot? EF: Our basic philosophy on all of that is that the base power level that you need to get to in order to do things, is attainable multiple ways, its attainable in whatever way you most enjoy playing the game. So those items will be available to WvW players, I can get those items in WvW. If I’m a dungeon player and all I want to do is play dungeons then I can get sort of to that power level by playing dungeons. If I’m a player who really enjoys crafting and really enjoys being out in the open world, I can get those items by either crafting or through drops or like that. In a lot of game there’s sort of a power tier that’s reserved for a particular type of content and then what happens is that content suddenly becomes the end game of the game, it becomes the thing you have to do because it’s the only way to get that power. And so what we did is spread that power out, throughout all the different types of content so you shouldn’t feel like you have to do dungeons or that you have to do WvW or that you have to do this. A big part of Guild Wars 2 is all about playing the game the way you want to play. And as Colin mentioned before, if I get that tier of items by playing dungeons those items will have a certain appearance and the only way to get that appearance is by having attained those items through dungeons. The same goes for crafting, there’s a certain look to the super high level crafted items that you can only get by crafting the item. There’s a certain look, there’s a WvW armor set that you can only get through playing WvW. And so that high end reward thing, appearance is really the thing, but as far as power goes, you can get power by doing any part of the game. Guild Wars 2 Fan Blog: I wanted to ask you a question about Martin Kerstein’s blog post about building community. Recently he wrote that you will be opening new forums, the official ones, and I wanted to ask what kind of a shift does it mean for your community policy. I mean your community managers were often present on different fan forums like Guild Wars Guru, does it mean they will be coming back to the official forums and they won’t be appearing on community forums? When will the forums officially be launched and will they be available only in English or will there be sub forums in other languages? Regina: I guess that’s my question. In terms of what it means for the community, it means that we will be participating on the official forums but we don’t think that it means that the fan sites will die out as some people have been predicting. The thing is that a lot of people enjoy having the freedom and being able to speak their mind. They don’t want to be moderated by “the man” which can happen on official forums and our community philosophy is that is that we want to have a welcoming and friendly community with productive discussion and we will moderate to that effect. And it does mean that we might not have as much time to communicate on different fan forums, but that doesn’t mean we won’t still be reading and that we won’t still be watching. In terms of supported languages the forums will be in languages that we have community managers for, so the main languages for the game. CJ: Wherever you post we’re always watching! Regina: Even if we don’t post, we’re reading. Guild Wars 2 Spain: (audio unclear) What you can tell us about Ebonhawke? RS: Ebonhawke is the last real bastion of the Ascalon resistance, the Ebon Vanguard. They’re being assisted by the queen of Kryta who has sent seraph, who have an Asura Gate in Divinity’s Reach through which she sends supplies to make sure they’re provided for against the charr. They’ve been holding out for a very long time right now and they’re on the edge of a treaty with the charr. If that goes through Ebonhawke’s position will probably be a lot more stable but as it is they are sort of losing the battle against the charr in Ascalon. The charr have had Ascalon now for a very long time and have pretty well kept the line against the humans; the humans have resorted to guerrilla tactics to try to keep the charr off balance. But they just don’t have the forces to commit to taking any part of Ascalon back, they can only really keep the fortress. A lot of people in Ebonhawke feel that if the Queen would give them more support, more troops they might be able to take part of Ebonhawke back, so there’s a certain amount of friction there. There’s also friction in the fact that the people holding Ebonhawke tend to be the descendants of Ascalon, the descendants of King Adelbern and so forth, and the Queen of Kryta sort of rules them right now and they feel like they should be an independant country but they’re trapped in the position where they have to rely on Kryta so they can’t really be independent. They’re hoping that if they can work this through, then they can once again have their own leadership, their own king. Guild Mag Spain: My question is focussed on the lore in Guild Wars 2. In the game how will we be able to explore the lore of the early Tyria? RS: There are a lot of ways that we get lore across to the player. One is in the personal story where your character actually goes investigates the Durmand Priory which is very big on finding out ancient lore finding anything that was left by the (not clear, lords possibly?) in particular hopefully to fight the dragons with, but you can follow a story chain, you can make choices that will give you more information on that if that’s what you’re interested in. Throughout the rest of the game we’ve also got places you can go find, people you can interact with, locations you can recognise from Guild Wars 1 and some that are even older than Guild Wars 1. When you go to Orr you’re going to get a lot of information going back and forth from place to place about how that country operated, how the people there lived and that will give you a lot of very initial information on the humans in Tyria. CJ: There’s a lot of unanswered questions from Guild Wars 1 that the answers are scattered all throughout Guild Wars 2 as well, so there’s lot of great Easter Eggs for people who love Guild Wars 1 lore. And we tried to give all the lore of the world in there so people who have never played Guild Wars 1 can actually understand the story and understand the history without having to go back and play GW1. You’re going to learn all that by just playing Guild Wars 2. RS: By playing Guild wars 2 we want you to love Tyria, and if you love Tyria then this past information, this historical egg, stuff in the background is going to be important to you as well. Guild Wars 2 Spain: Will the game be made available with Spanish voice acting as well as text at some point in the future? KP: I don’t think we’re sure about that. EF: I think that’s something that we’re continuing to investigate, I’m not sure we actually know about that. Sorry. CJ: The people who can answer that are not sitting in this room. Mediavida: In our community, everybody plays a lot of games especially esports like for example League of Legends our mates are very interested if you’re likely to orient your PvP into an esport in a more competitive way, organising tournaments etc. EF: We would definitely like our PvP to become an esport. I think there are a lot of things you have to do to support that. The first thing you have to do is come out with a game that is sort of broadly appealing that can bring in a big PvP audience and keep those players playing it. So that’s kind of the thing that we’ve been concentrating on the most, is trying to make the PvP game that is really accessible that people that can kind of get into and really play and has a lot of ability to really master it. I think once we do that then you have to kind of come in with that second tier of support like observer mode and being able to watch matches and having tournaments and having support for all of that. So it’s fully our intent to support the game as an esport and right now we’re concentrating on releasing a broadly appealing accessible and fun to watch form of PvP and that’s kind of our concentration at the moment to do that, but we definitely look at our competitive PvP as an esport. Mmorpgmania.it/gw2italia.it: We had a chance to try the game and noticed that the side kicking system didn’t work inside instances. We were wondering if you are going to confirm this or if in the future or in the release there is a side kicking system inside instances or dungeons? CJ: There is side kicking in all of dungeons in the game. Each dungeon whether it is a story dungeon or an explorable dungeon has a correlated level that your character gets side kicked down to if you are over the level of the dungeon, but we do not sidekick you up to the level of the dungeon. So to do any of the dungeons in the game you need to get be high enough level to participate in it and then if you go over level for it, we’ll side kick you down to keep it challenging and fun for you. So for example the Ascalon Catacombs story dungeon is a level 30 and if you get up to say, level 38 we’ll side kick you down to the level of the dungeon so you can keep playing it with everyone and have it be fun and challenging for you. EF: One thing to note is that, earlier we talked about how we were going allow players to sidekick up in level we actually don’t have that functionality in the game and the reason we don’t have it is because when we were going through the game we thought one of the really important moments in the game was kind of that moment where you ran into something and you weren’t quite powerful enough to overcome it, or skilled enough to overcome it, and we wanted to give people the ability to kind of be able to build their character in such a way that you could by those moments instead of just bypassing them by getting artificially side kicked up a level. And so we don’t have side kicking up anymore in the game anymore except for in WvW. So if you want to think of how our dynamic level adjustment works is that it automatically happens downwards in PvE and automatically happens upwards in WvW. And competitive PvP obviously you get set to equal level everybody. So that’s kind of how that works now.